DARWIN,THE TOP END : Darwin the capital of the Northern Territory's huge 1.3 million square kilometres of wilderness, was entirely rebuilt after being flattened by a tropical cyclone in 1974. Its architecture is now a blend of contrasts with historic stone buildings such as the Old Navy Headquarters, the 1883 Fannie Bay Jail and Brown's Mart and new cyclone-proof structures like the MGM Grand Casino. 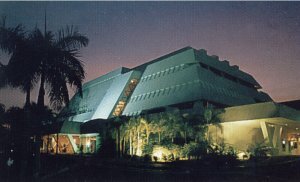 Darwin's other attractions include a wharf precinct with a fascinating pearling exhibition; Botanic Gardens whose 34 hectares of tropical vegetation provides welcome shade from the Top End heat; and the colourful Thursday night Market on Mindil Beach-a chance to eat satays and sip a drink beneath a fluorescent sunset. More action-packed spectacles include bronco-riding and steer wrestling when the rodeo circuit comes to town; or, journeying 65 kilometres south of town to watch the daily feeding frenzy of the 'jumping crocodiles' from a boat on the Adelaide River. JEWELS OF THE NORTH : Kakadu National Park, 250 kilometres south-east of Darwin, is a 20,000 square kilometre magical kingdom of forests, flood plains, ancient art and millons of birds. Its highlights include waterfalls like Jim Jim and Twin Falls, and Aboriginal rock art sites of extraordinary antiquity, including Nourlangie and Ubirr Rock. The yellow Waters wetlands must be seen from a boat in order to appreciate burmbies, magpie geese and from an appropriate distance, crocodiles. 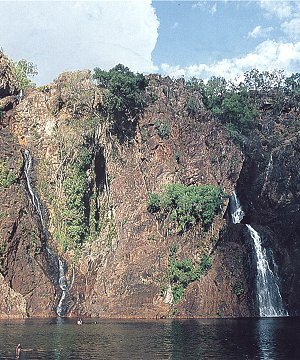 Some visitors rate the spectacular waterfalls and lush rain-forest of Litchfield National Park, south of Darwin, as even more fascinating than Kakadu. Further south, Katherine Gorge National Park, has a series of stunning sandstone cliffs rising above the Katherine River. Some 365 Kilometres north of Alice Springs are the Devils Marbles, an amazing cluster of huge granite boulders which Aborigines once believed to be the eggs of the legendary Rainbow Serpent. Rocks of ages : The beautiful Kata Tjuta (the Olgas) and Uluru (Ayers Rock) lie in the Uluru-Kata Tjuta National Park, south-west of Alice Springs. Kata Tjuta, meaning 'many heads; are a collection of 36 massive stone conglomerate domes situated some 32 kilometres to the west of Ayers Rock. A walk within the convoluted landscape between them, to 'the Valley of the Winds', is a spellbinding excursion. Their European name arose when explorer Ernest Giles named the largest dome Mount Olga, after a Russian duchess. However, according to the Aborigines, some of the domes represent early giants who fed on their people. Uluru (Ayers Rock) is the largest rock monolith in the world. Six hundred million years old and almost 10 kilometres around its girth, this giant berg of sandstone is an Aboriginal sacred site, and in a different sense, also a 'sacred' site for visitors from all over the world who make the strenuous climb to the top. Uluru is located 465 kilometres south of Alice Springs by road.